Last month, VernissageTV had the privilege to be in invited to see a private presentation at the Robert Rauschenberg Foundation in New York. The presentation at Robert Rauschenberg’s former studio in Manhattan had its focus on two fascinating aspects of Rauschenberg’s oeuvre: the Cardboards series and the Gluts series. We were not only able to document the exhibition, but two renowned Robert Rauschenberg experts, Susan Davidson (curator at Guggenheim and RRF Board member) and David White (curator at Robert Rauschenberg Foundation and Board member) even gave us an exclusive tour of the presentation and provided us with fascinating insights into Robert Rauschenberg’s life and work. The above video is an excerpt of the tour, the video with the complete walk-through with Susan Davidson and David White is available after the break. Prior to the tour, we had also the opportunity to speak with artist, sculptor and photographer Jean-Marc Bustamante and Pratt Institute Graduate Julia Monk about Robert Rauschenberg’s Cardboards Series. The interviews with Jean-Marc Bustamante and Julia Monk are available after the break. We had also the opportunity to speak with the Executive Director of the Robert Rauschenberg Foundation, Christy MacLear. In a video interview that we will publish soon, Christy MacLear provides us more information about the Foundation’s history, mission, grants and programs, and future presentations and activities. The Robert Rauschenberg Foundation: Cardboards and Gluts. Guided tour with Susan Davidson (curator at Guggenheim and RRF Board member) and David White (curator at Robert Rauschenberg Foundation and Board member). 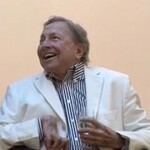 The Robert Rauschenberg Foundation, New York City, May 18/21, 2012. 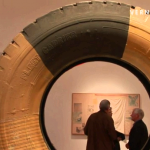 PS: See also: VernissageTV Classics (r3): Robert Rauschenberg and Darryl Pottorf at Jamileh Weber (2006). 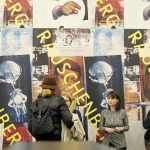 Robert Rauschenberg has been very productive and created an oeuvre that is innovative and prolific. 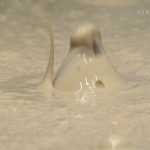 He is one of the most famous artists, but despite of that, some aspects of his work are not very known, even to experts. The Cardboards series is one of them. 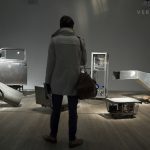 Rauschenberg had his breakthrough with the Combines, works that are neither sculpture nor painting, but a combination of a variety of objects, materials, and artistic techniques. The Cardbaord works that he produced after he moved from New York to Captiva Island in Florida in 1970 present a continuation of that body of work, but instead of using all sorts of materials, Robert Rauschenberg confined himself to discarded cardboard boxes. In the 1980s Robert Rauschenberg turned to a new material: metal. The Gluts series was inspired by a visit to Houston, when the Texas economy was suffering a receccsion due to a surplus of supply (glut) in the oil market. Back in his studio in Captiva, he began to collect gas-station signs and other industrial parts and transformed them into wall reliefs and freestanding sculptures.